Rock Hill, S.C. Former Florida Governor Jeb Bush spent Tuesday talking about foreign policy and national security at a forum hosted by Winthrop University. He stayed after the event to talk to one supporter who couldn't be there. 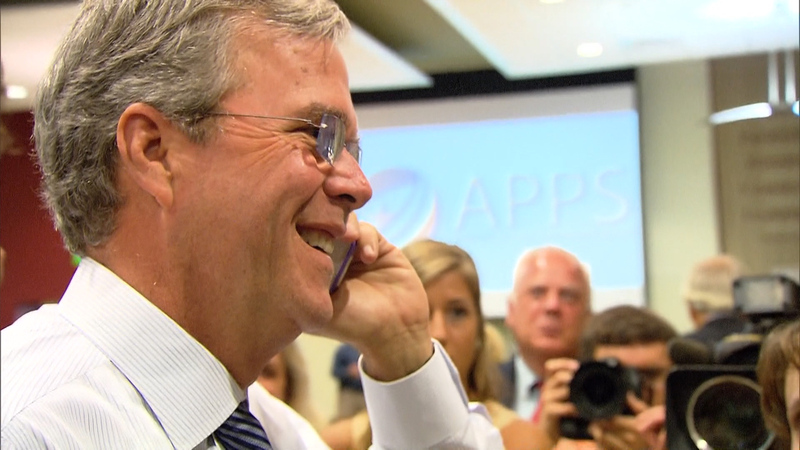 As Bush was shaking hands and taking selfies with attendees, Winthrop student Sara Tennant handed her phone to the Republican presidential candidate. On the line was Tennant's fiancé, Isaiah Morris. Morris told Bush that he's reading former president George W. Bush's book "41: A Portrait of my Father," which details George H.W. Bush's life and presidency. Morris said he admires the 41st president, and he plans to model his marriage on lessons he's learned from the book. "It's impacted my life, preparing to be the man and husband my fiancée needs," Morris, 21, told CBS News. Bush touched his hand to his heart and thanked Morris, evidently also impacted. "You're a lucky guy. She's beautiful, and I bet she's really smart, too," Bush told Morris. Morris and Tennant have set a wedding date for May 2016. "I need your vote. I need you to get 10 other people to vote for me," Bush told Morris. "Hope to see you on my next trip here." Morris, who leans right on economic issues but left on social issues, confirmed he would vote for Bush in South Carolina's February primary and said he has already rounded up five friends to do the same.